The inaugural edition of contemporary Australian restaurant Salted & Hung Monday Underground Supper Club sessions on Monday 16 April at 7pm will feature cocktails from award-winning cocktail bar NATIVE. 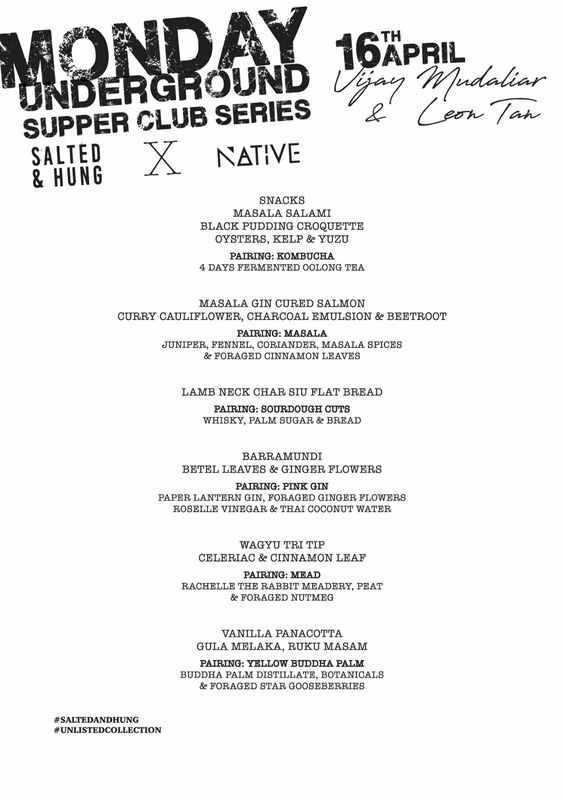 Salted & Hung’s Supper Club sessions is part of the restaurant’s vision of reinforcing the concept of pairing drinks with food, and menus will revolve around the partner bar’s forte while staying true to executive chef Drew Nocente’s penchant for curing, fermenting, and grilling. This five-course cocktail pairing dinner will see NATIVE founder and owner Vijay Mudaliar and head bartender Leon Tan put together cocktails using foraged ingredients such as nutmeg, ginger flowers, and even ruku masam and buddha palm – a concept that’s garnered them international acclaim – to complement the progressive cuisine from Salted & Hung executive chef Drew Nocente. Seats are $150++ per person with cocktail pairings. To book a spot, email info@saltedandhung.com.sg or call 6358 3130.